VENUS IN DER SCHMIEDE DES VULKAN Öl auf Kupfer. Verso auf der Kupferplatte alte Inventarnummerierung „W.21”. Am Unterrand der Rückseite Nennung eines Verkaufes von April 1913 „Vente Blumerel à Bordeaux/ Expert Descamp.. (?)”. Auch Frederick Bouttats d. Ä. (1612 - 1661) steht hier zur Diskussion. Die Feinmalerei weist sowohl stilistische als auch bildinhaltliche Elemente aus Werken der genannten Künstler auf. Old inventory no. “W.21” on the reverse of the copperplate. On the lower margin of the reverse inscription of a sale in April 1913: “Vente Blumerel à Bordeaux/ Expert Descamp.. (?)”. 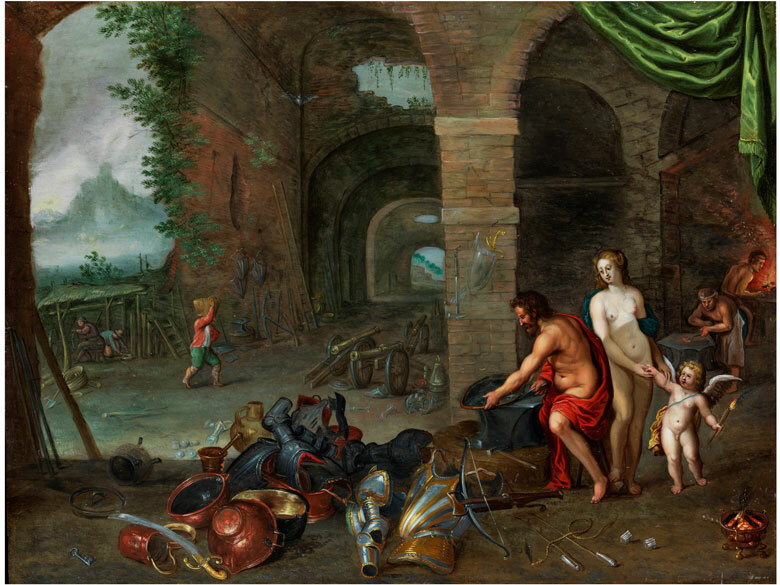 The artist Frederik Bouttats the Elder (1612 - 1661) can also be considered in this context. The fine painting shows stylistic as well as contentual elements from works by all of the aforementioned artists. The subject of the painting in this lot was often taken up in the first half of the 17th century, especially due to the wartime events around and during the Thirty Years War.The master has depicted the Forge of Vulcan, the martial god of blacksmiths (in Greek mythology Hephaestos) in the style of an antique ruin. A view of a deep mountainous landscape is visible in the upper left. 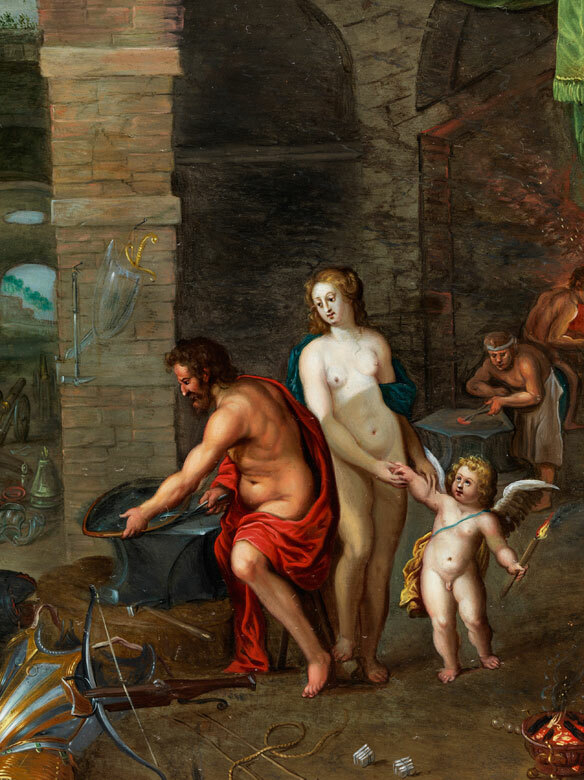 The main protagonists are depicted off centre, slightly to the right: the mythical blacksmith is dressed in a red velum and busy creating a shield on the anvil. 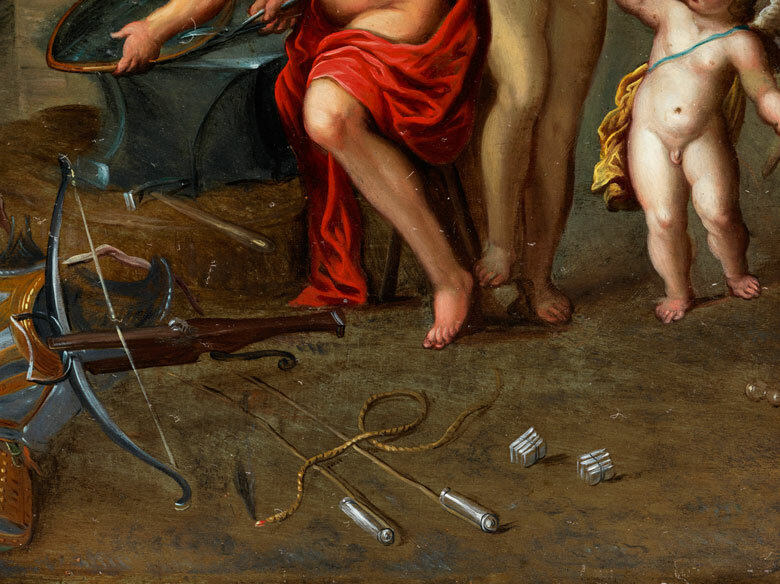 Next to him Venus, the goddess of love, is depicted naked accompanied by cupid with an upright burning torch, which can be interpreted as a symbol of the spark of love. Further to the right picture margin two blacksmith assistants are busy at the forge. 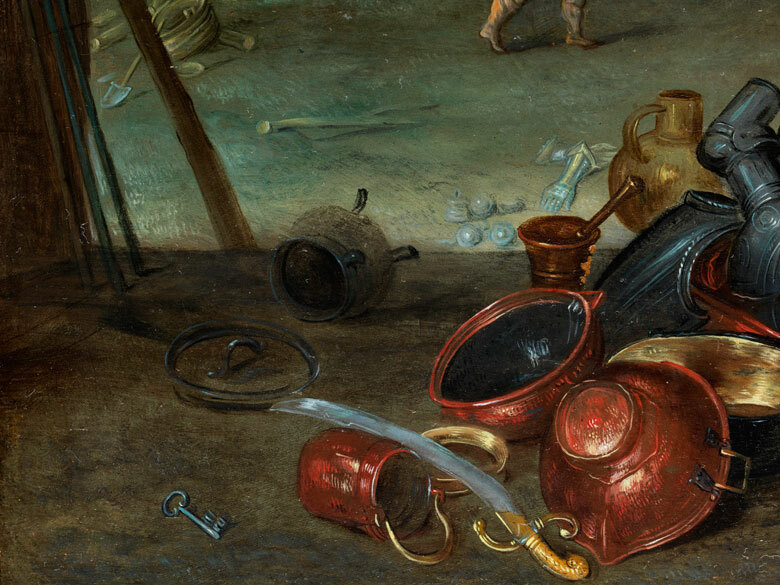 A copper cauldron with embers is depicted at the corner below. 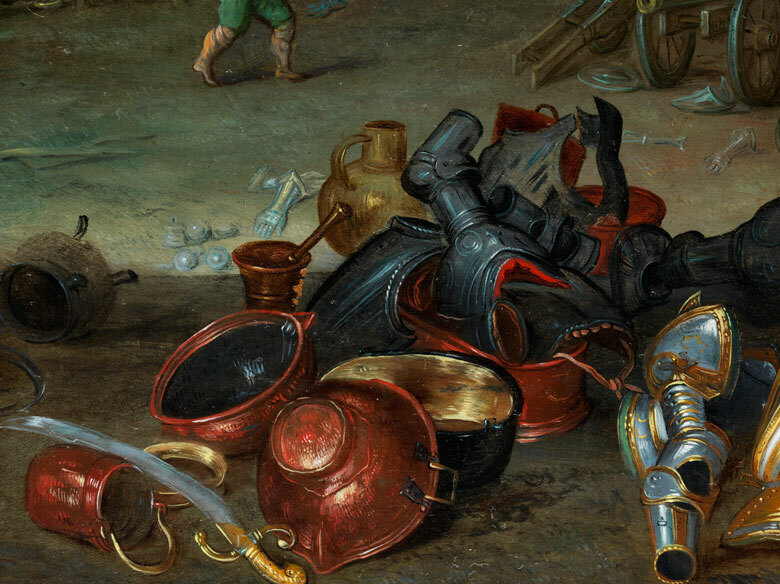 In the left half of the painting a myriad of finished armour, weapons, copper and brass cauldrons and further forged objects are displayed on the floor. 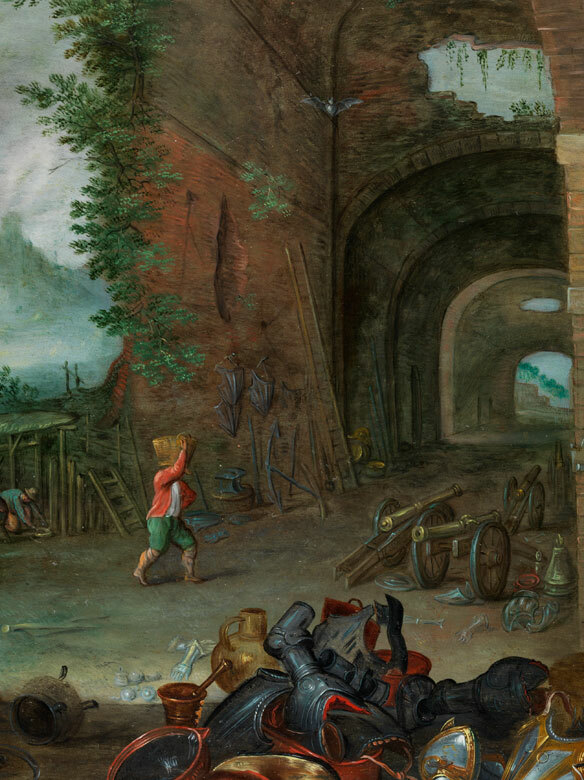 On the left a depiction of a craftsmen’s hut with two workers and another man carrying a basket walking to the right. 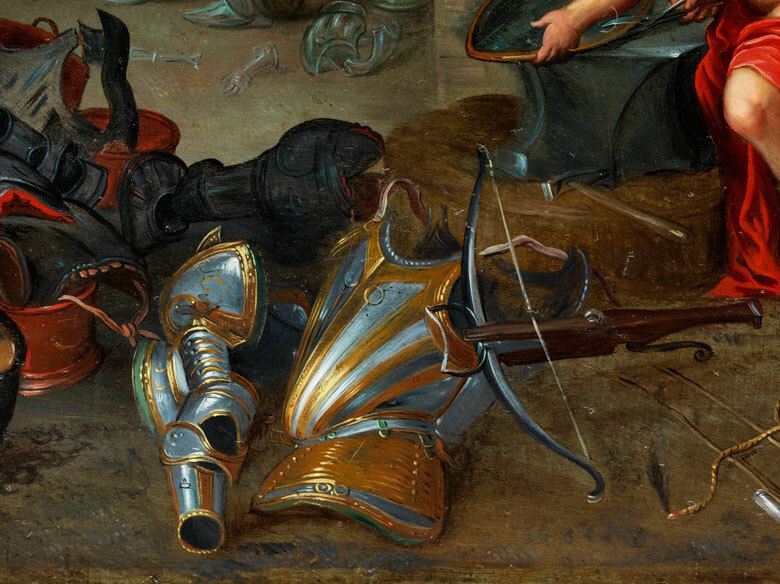 Subjects like these were especially popular on the occasion of a ceasefire or in preparation for new battles.